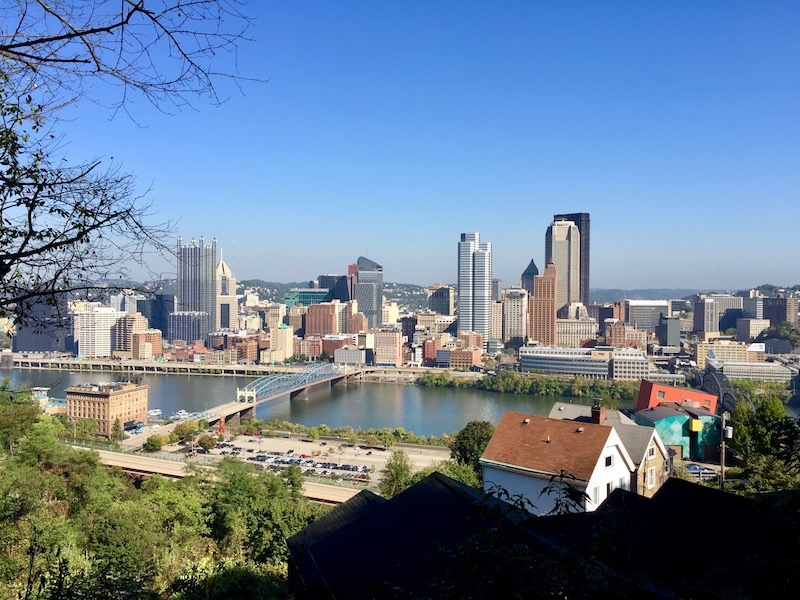 If you’ve lived in Pittsburgh for any recent amount of time–say, the last ten years, maybe just five would do it–the rate of change can seem extraordinary. 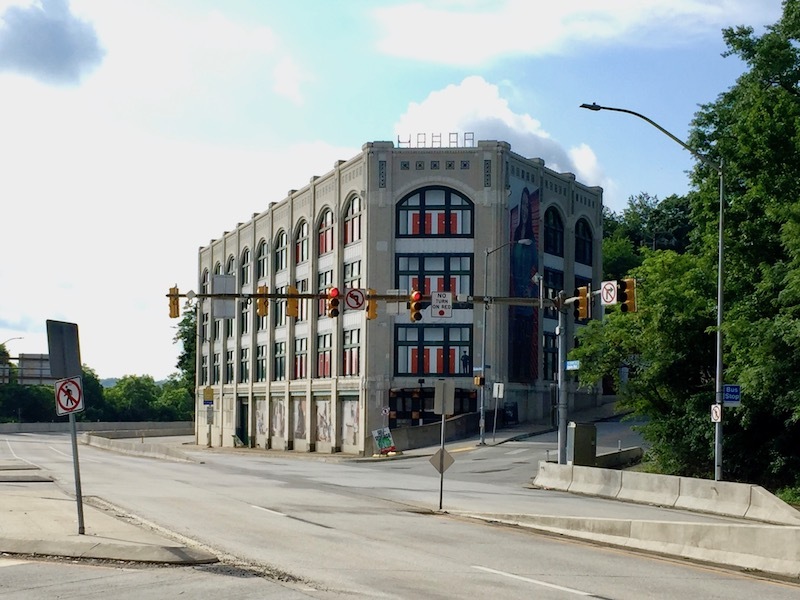 Entire neighborhoods–East Liberty, Lawrenceville, The Strip District, to name the most obvious examples–have been radically transformed, downtown has a couple new skyscrapers, rents and home prices are finally starting to match other metro areas, gone are one-dollar beers and big red sauce Italian joints. So it can be comforting to us old-timers when we’re reminded that not everything is changing quite so fast. If you haven’t seen that epic chase–or even if it’s just been a while–rectify that now, in the original French. See what you recognize and what you don’t. And if you really want a challenge, try to name the main filming locations–they’re (almost) all right in town. 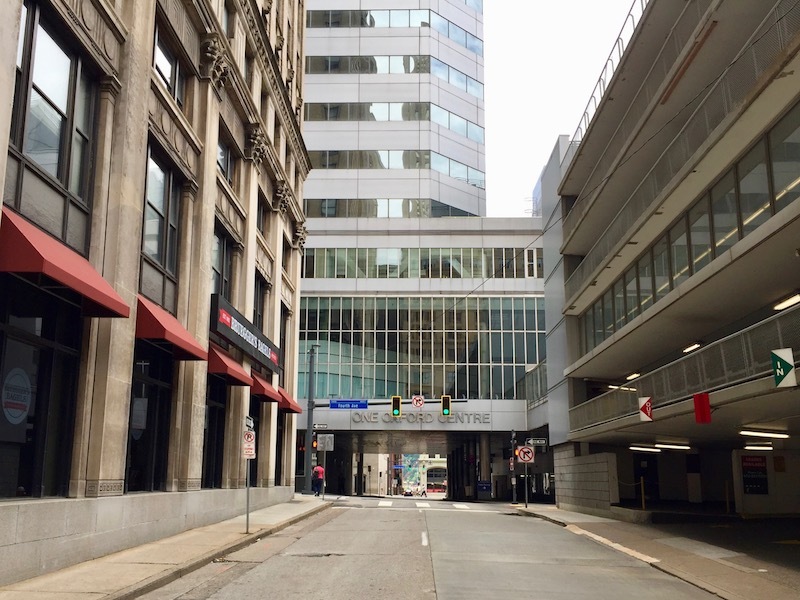 Bigelow Boulevard is, of course, a “gimme,” and you shouldn’t have any problem with the downtown shots, but after that it gets a little trickier. For the opening of the sequence, father and son cops Vince and Tom Hardy head out in full dress regalia toward the Policeman’s Ball, presumably at the Point (based on the “two years later” setting elsewhere in the film). 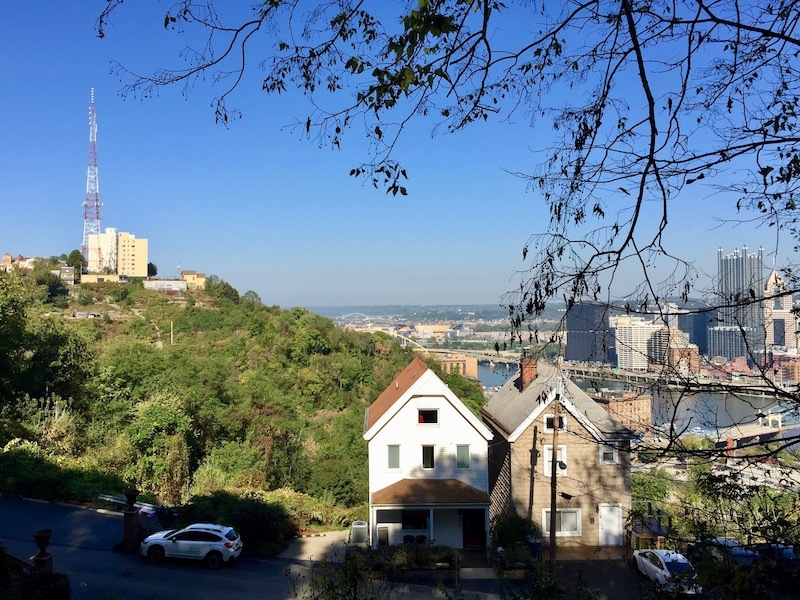 The locations team could’t have picked a more Pittsburgh scene, replete with cross-river views, the downtown skyline, and a short barrier wall before a steep drop-off. Not that it matters, but Troy Hill/Reserve Township even seems like a believable cop neighborhood. Almost nothing in this particular panorama has changed in the last 26 years. There are more wires on the telephone poles as high-speed Internet arrived in the between-time and the trees have definitely been allowed to grow up, but that’s about it. Downtown does have some new features to its skyline (we’ll get to those in a bit)–but you can’t really see them from this angle. 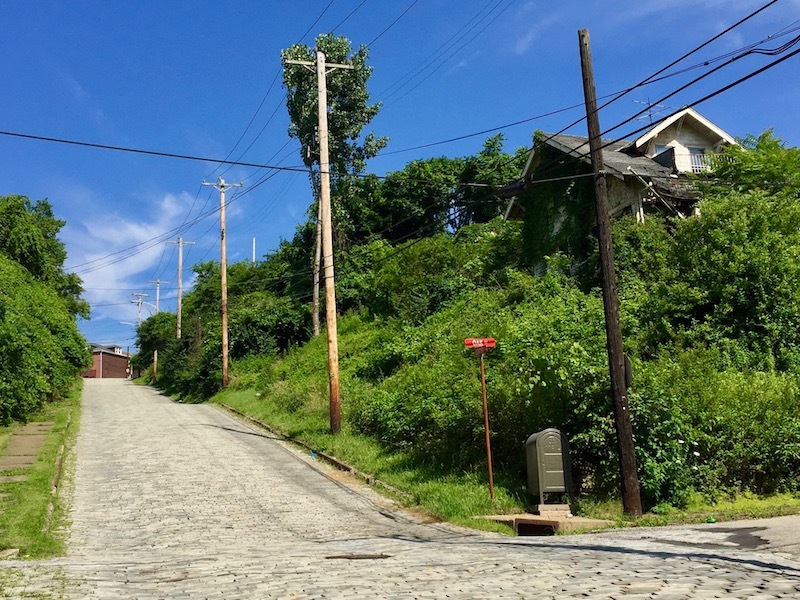 There is no possible way to take Bigelow from Troy Hill, so the Hardys are magically transported across the Allegheny to Ridgway Steet, at the far eastern/upper end of the Hill District, for their careening entry to that fabled cross-city byway. Just like we saw on Mt. Troy Road, the tiny starter saplings on Ridgway in 1992 have grown to legit shade-producing coverage today–in fact, we couldn’t even get the same angle as the Striking Distance shot because we’d be buried in shrubbery–chalk one up for Mother Nature! Other than that, we can see the city replaced the old wooden street light pole and the homeowner appears to have had some porch work done. No idea what happened to the Silverado in the driveway. Striking Distance filming closed a pretty major east-west artery for the Hardys’ high-speed pursuit of The Polish Hill Strangler and the crew made the most of the opportunity. The approximately half-mile stretch of Bigelow from the the Bloomfield Bridge to the intersection at Herron is run backwards and forwards, crossing lanes and milking busy intersections. The movie viewer is rewarded with a lot of quick-cut chances to see the road and its pedestrian overpasses. The biggest change here is the old Geyer Printing building, which was sold and converted into a self-storage place a while back. Gone are the big G-E-Y-E-R letters on the roof and instead we’ve got the imagery of self-storage plastered over the former windows. The whole intersection got a heavy-duty resurfacing (in cement) a few years back and still looks like it’s brand new. 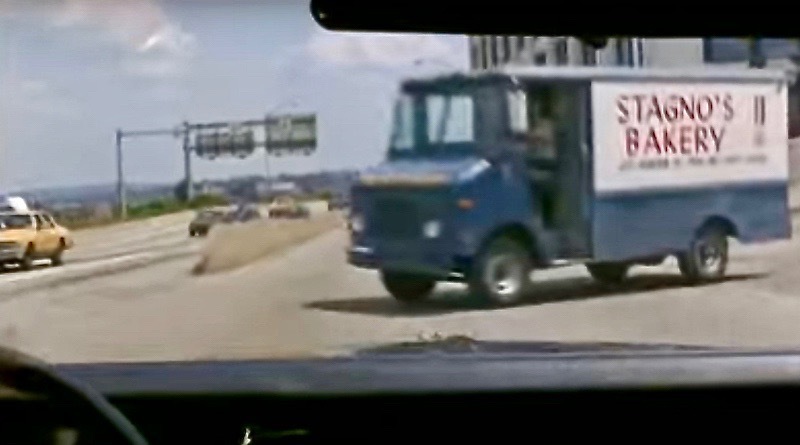 Side note: I wanted to bag one of those Stagno’s Bakery trucks in the wild, but couldn’t actually find one now that I was looking. Sigh. OK, now we’re getting to the good stuff. 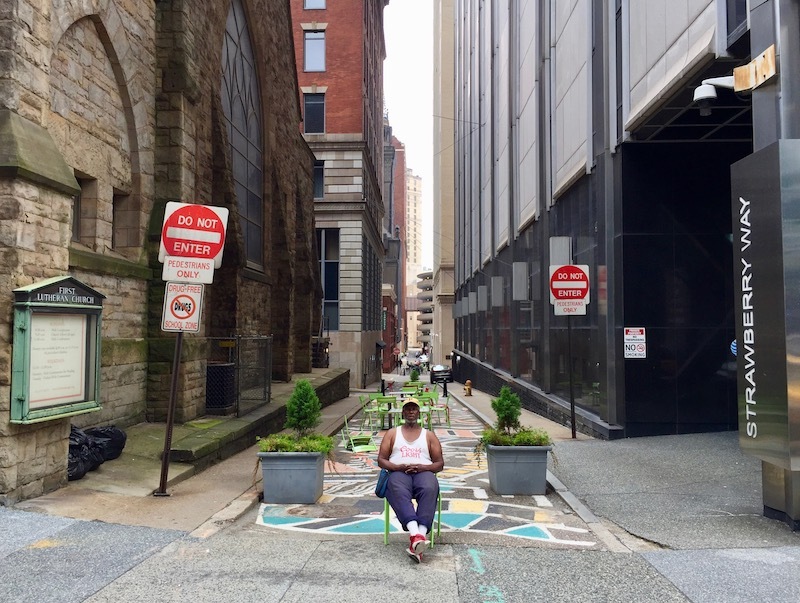 Little Strawberry Way, the single-lane alley that runs parallel between Sixth and Seventh Streets, Downtown, has had perhaps the most dramatic makeover of our locations. Starting maybe ten years ago, the long, lower block of Strawberry between Smithfield and Liberty started getting dressed up with temporary art installations. More recently, the city went all-in on Strawberry’s conversion from car-friendly alley to pedestrian hang-out zone. 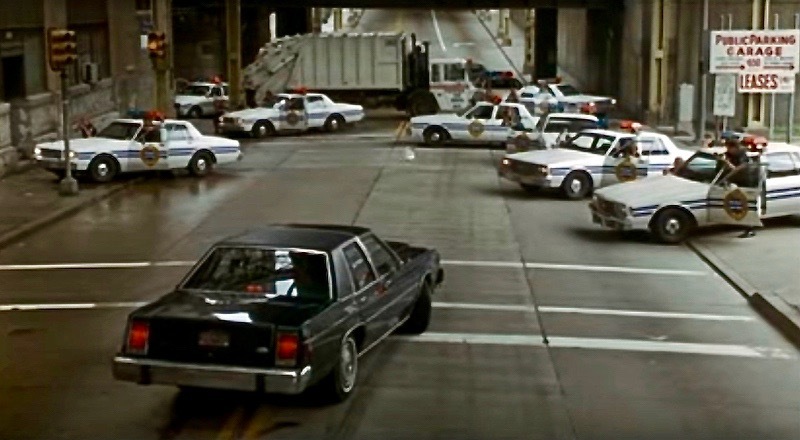 Currently, there are two blocks entirely closed-off to traffic, including the short stretch from Grant to William Penn Place where the Hardys dash down in a shortcut to intercept The Strangler on William Penn Place. These are nicely appointed with colorful street painting, tables and chairs, potted plants, and special lighted signage. 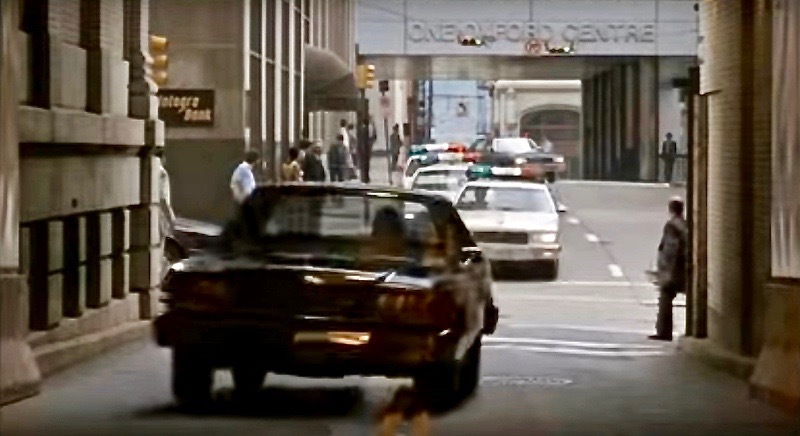 Starting to sound like a broken record (1993)/streaming audio loop (2018), but the 400 block of Cherry Way, Downtown looks pretty much the same as it did when Pittsburgh’s finest chased that ’89 Ford. 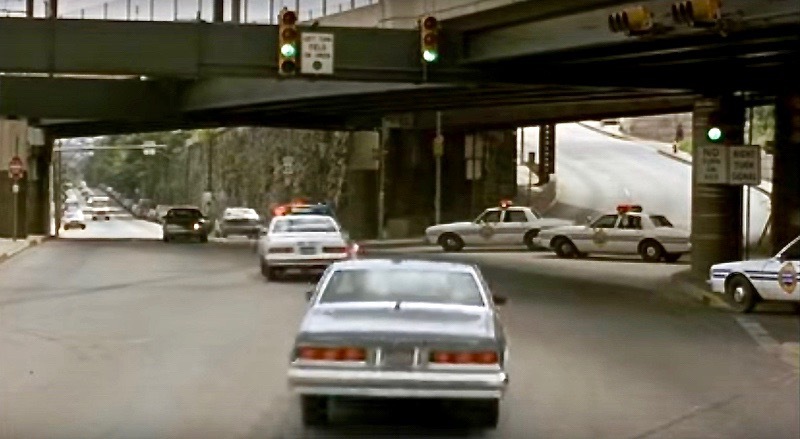 Based on the green lights in both lanes, we assume traffic was still one-way (the other direction) in 1992 which would have made this a difficult escape route for the Strangler. What’s changed the most in this scene is a building you feel more than see. Kaufmann’s–Pittsburgh’s original, longest-standing downtown department store–was still open and operating by that name in the 1990s. 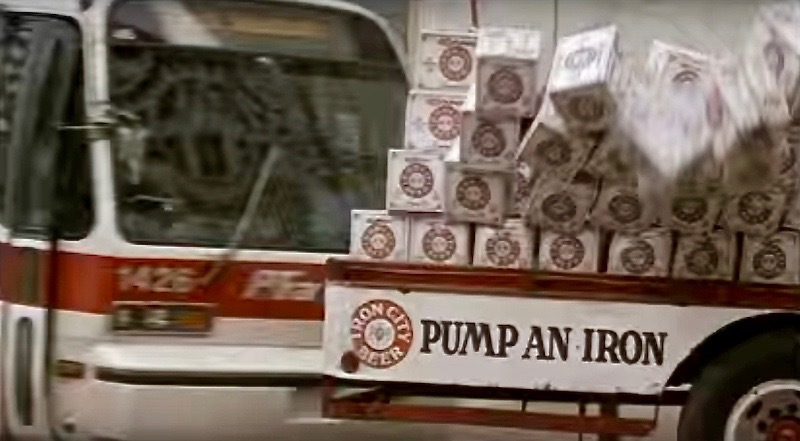 I know–I bought business casual khakis there. 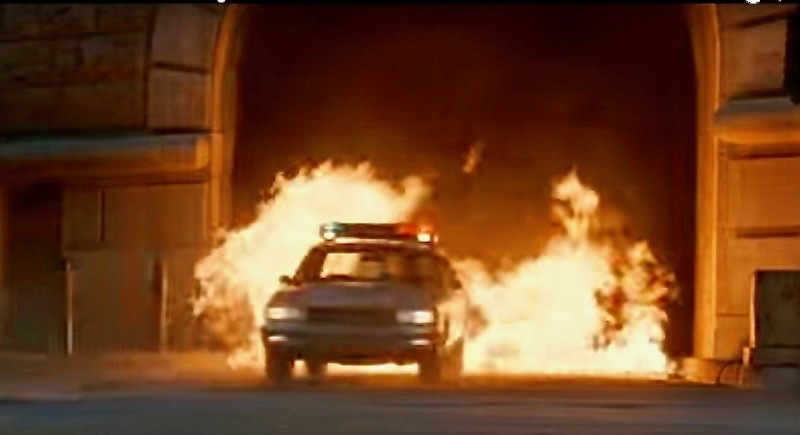 The building still straddles little Cherry Way, forming a tunnel the filmmakers shot through for the chase scene. The downtown Kaufmann’s would be rebranded to a Macy’s in 2006 and then closed for good in 2015. Currently, the elegant, 12-story building is undergoing renovation to become fancy apartments. 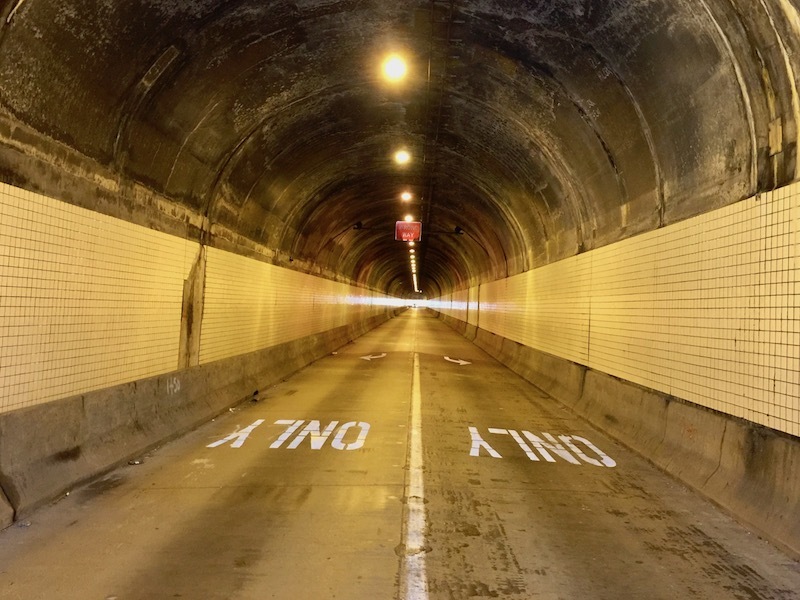 You’re thinking, what could possibly have changed in the Armstrong Tunnel? The answer, it turns out, is more than you’d expect. First off, the tile work looked a lot better in 1992–so much better we wonder if it had recently gotten a rehab treatment. Today, there are big chunks of the white ceramic that have separated and disappeared, leaving a pock-marked, water- and oil-stained surface throughout. 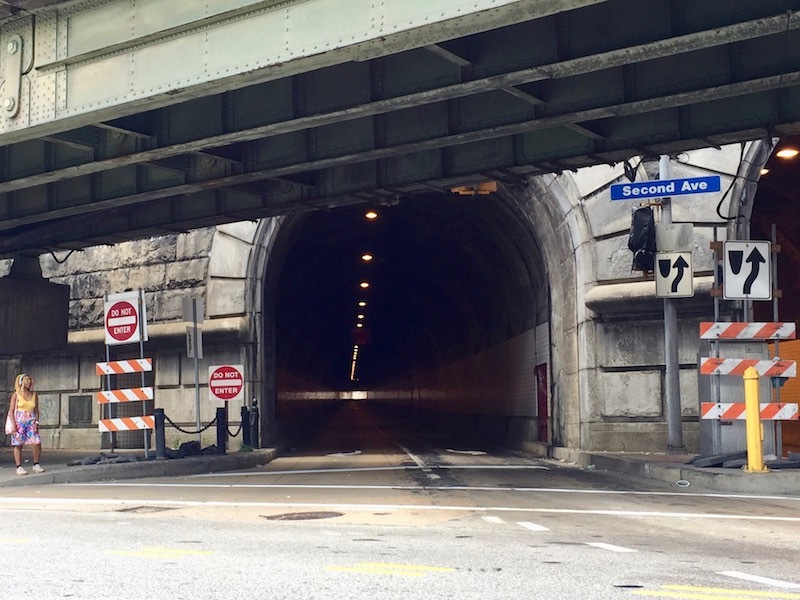 More interesting, though, is the tunnel’s apparent change from a two-way, bi-directional route (note the double yellow line in the earlier picture) to its current configuration with separate, dedicated inbound and outbound tubes. 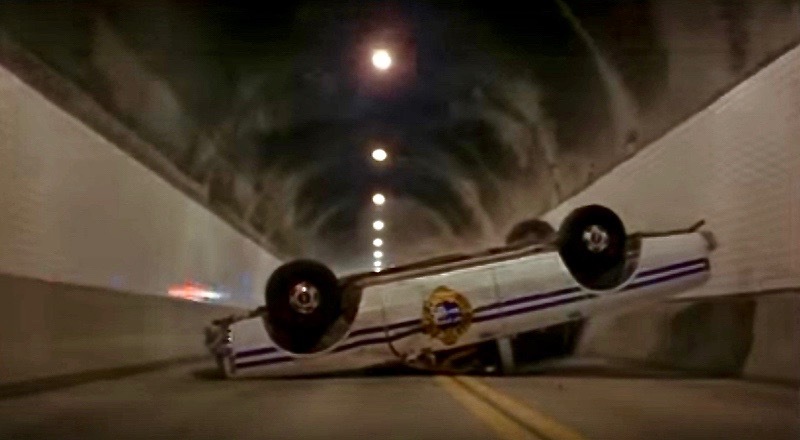 We have to wonder what was happening with the other tunnel in ’92. Maybe it was just a temporary closure to fix up the tiles? Who knows! You’ll be happy to know the fire in the Armstrong Tunnel was safely put out some time in the last couple decades, making the daring dash through burning police cruiser wreckage no longer required in passage from Forbes to Second Ave.
Fire or not, Steelers fans will remember this south end of the tunnel as the dangerous intersection where Ben “Why would I wear a helmet? I’m not playing football.” Roethlisberger almost ended both his life and career in a motorcycle accident in 2006. Like all the principal characters in Striking Distance (but not all the extra roles!) he made it out alive. This is another one where the real action is just out of the frame. On the near side, Point Park University continues to expand, gobbling up, restoring, and repurposing much of “First Side” downtown as it goes. Had the filmmakers chosen almost any other block in the area, we’d have a more obvious contrast. 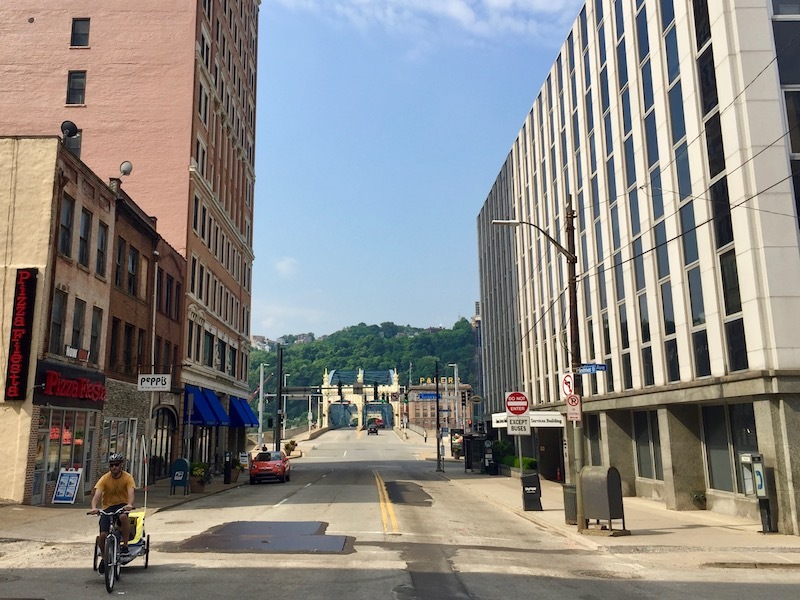 On the other side of these buildings, every cyclist will tell you Smithfield Street Bridge is the gateway to South Side bicycle-riding as the easiest, farthest, western-most entrance to the Great Allegheny Passage bicycle trail (which goes from here all the way to Washington, D.C.). 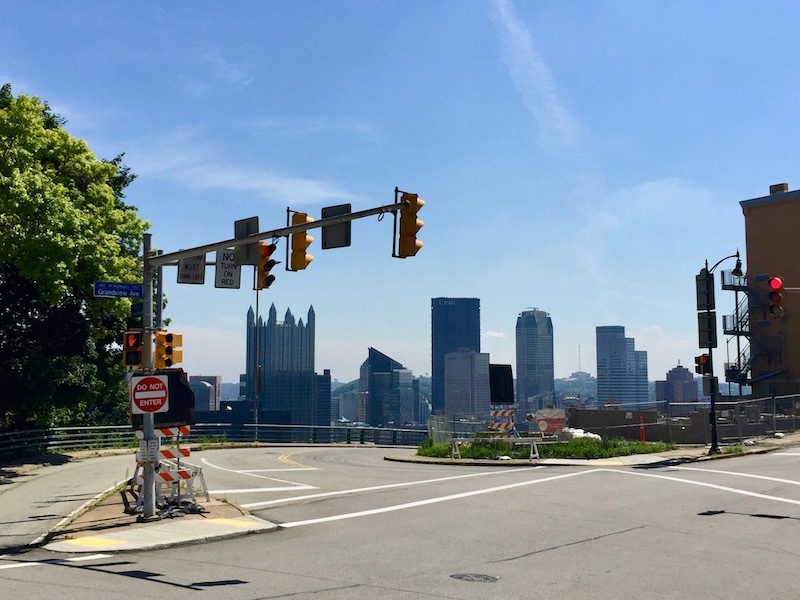 The town end of the bridge also has a semi-new dedicated bicycle passage to connect cyclists to the Jail Trail and a brand new switchback ramp from the bridge will take you down to The Mon Wharf and Point State Park, traffic-free. [That opens…next month?] … but you can’t see any of that in this picture. The Smithfield Street Bridge, a “lenticular truss bridge,” completed in 1883 and designed by Gustav Lindenthal is certainly one of the city’s most iconic crossings. The castle-like porticos on either end and gorgeous sine wave interlocking curves are about as perfect and classic as one could hope for from such a structure. 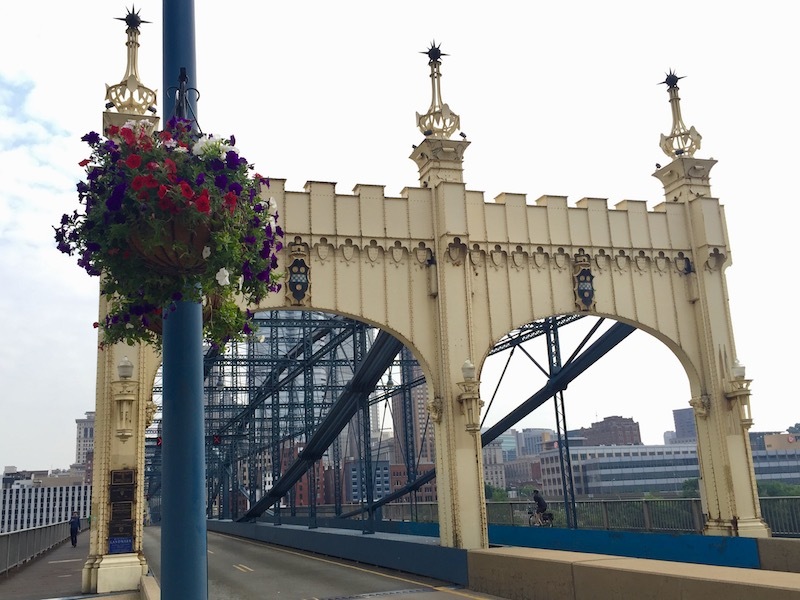 By the time this blogger arrived in Pittsburgh–just a few years after Striking Distance–the Smithfield Street Bridge had undergone a massive rehab including a new paint job of yellow-gold on the entrance ways and deep blue for the curving truss sections. But back in 1992, the bridge was still a dingy steel gray with a tree apparently growing out of the lane separator on the south end. It also had two-way car traffic on one half and train track on the other [see previous then photo]. Today, the re-do colors remain, but they’re faded, rusted, and graffiti-scarred; the tree is gone. It may be about time for yet another paint job on this old beauty. Pittsburgh’s modern light rail line (“The T”) was set up in the 1980s. 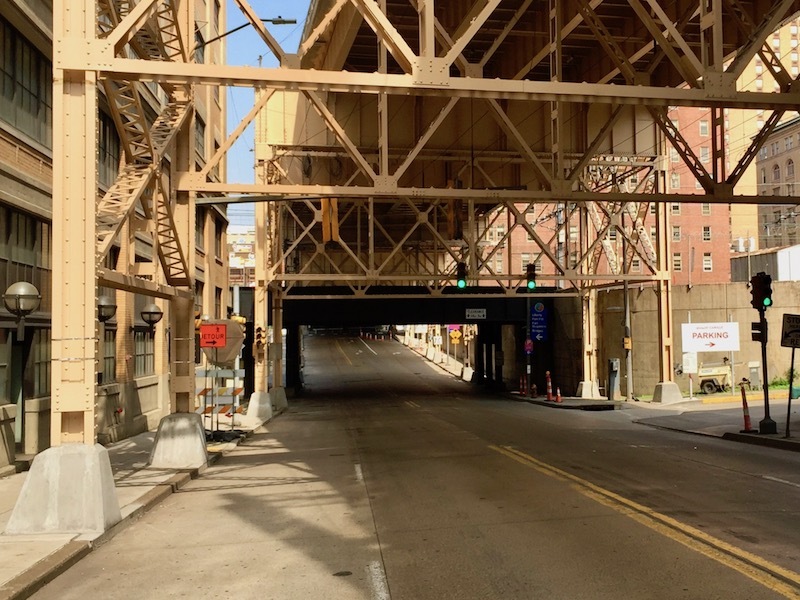 Though largely running on vestigial trolley tracks through the South Hills, the newer, elevated stretch of rail connecting to the Panhandle Bridge remains the dominant presence at the intersection of Carson and Arlington on the Southside as it did in the early ’90s. You’ll notice the same deep blue paint job the Smithfield Street Bridge received and an addition of one clearance height warning sign, but that’s all we’ve got here. 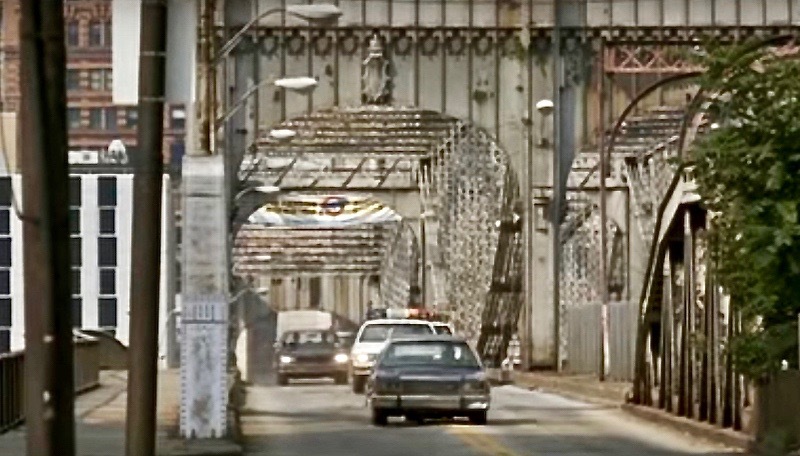 A little tip for budding action movie makers: if you want to set your picture in gritty, urban America, make sure you’ve got an elevated highway and/or train line to film under. 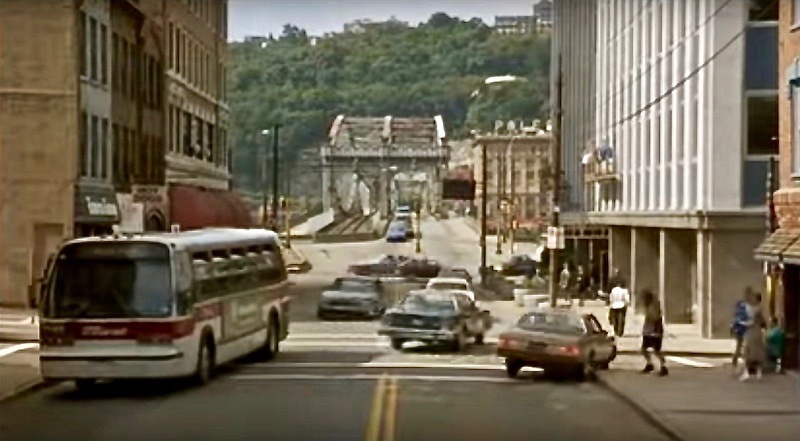 Pittsburgh has plenty of bridges, but the double-decker effect of Boulevard of the Allies rising over Second Avenue, Downtown, really only happens for a few blocks in this one location. Striking Distance writer/director (and Pittsburgh native) Rowdy Herrington wasn’t going to miss out on it. The cagey quality of 1920s-era steel girders with its heavy shadows and rumble from auto traffic above makes this space still feel like an action set–even on a quiet, sunny, Sunday morning. The steel beams appear to have been newly-painted, parking rates have gone up, and the bail bondsman (just out-of-frame) is open for business 24-hours. Of course The Polish Hill Strangler would take P.J. McArdle Roadway up to very-accessible Grandview Avenue in his escape route! 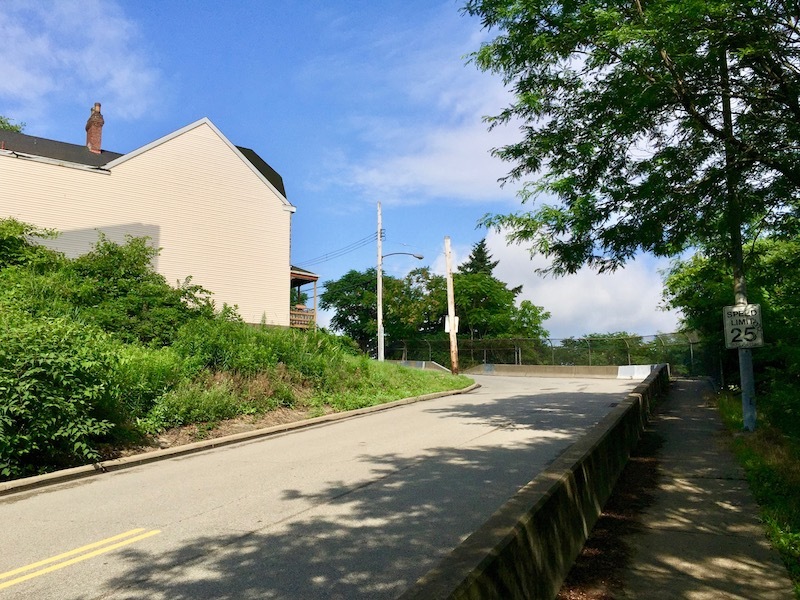 Mount Washington’s cobblestone streets, hairpin turns, and limited egress points are exactly what any clever criminal who “drive’s like a cop” would opt for. 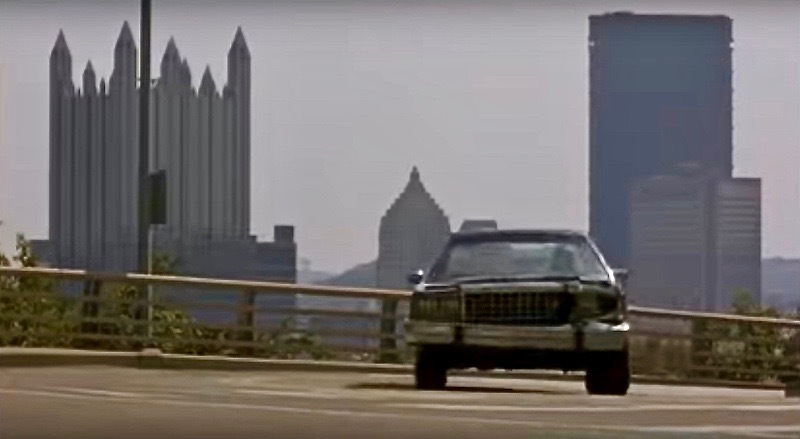 Regardless of the plot logic of this particular route, it leaves us with some great views of the Pittsburgh skyline…and that’s probably what Rowdy Herrington was really after. The main difference today is that downtown Pittsburgh has been in a major construction boom for the last decade or so and it’s left us with two big additions to the skyline. The 23-story Three PNC Plaza and the 33-story Tower at PNC Plaza were completed in 2009 and 2015, respectively. Both are now clearly visible [and blocking the view of Gulf Tower!] from Grandview Ave. 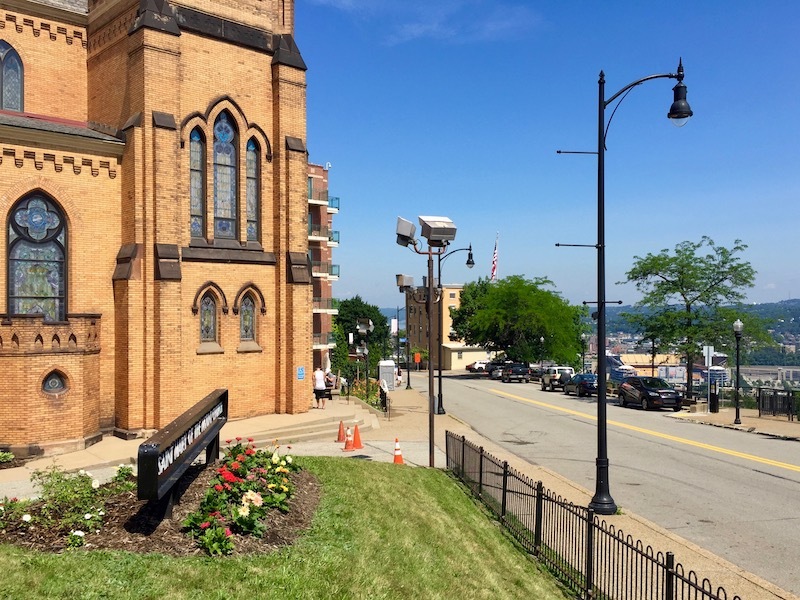 The lovely St. Mary of the Mount Catholic church still holds court at its prominent spot on Grandview Ave., its parishioners getting a glorious view of downtown Pittsburgh as they step out the big, oak front doors. We set up for our photo on the grassy lawn of St. Mary’s school next door, just like Herrington and the gang did back in the day–only, Orbit budget wouldn’t pony up for the crane shot and long lens. Regardless, it’s obvious the biggest difference from here is not what’s happening on Mt. Washington, but instead, what you can see across the river. The so-called North Shore has had a dramatic–almost wholesale–re-envisioning since the late 1990s. 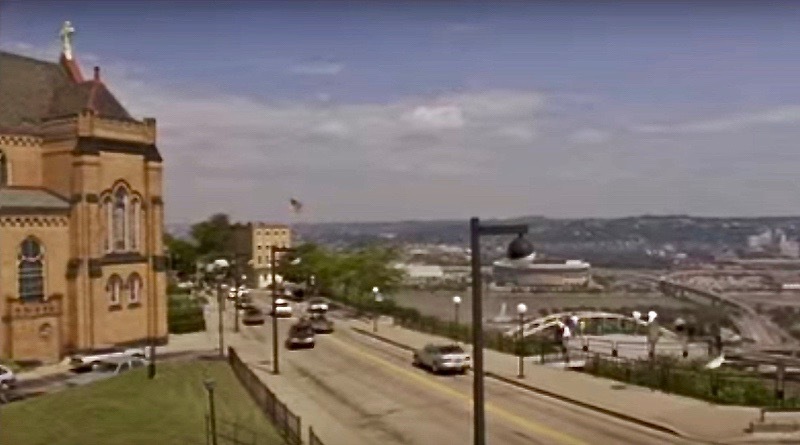 Still visible in the Striking Distance scene is Three Rivers Stadium and the acres of surface-level parking surrounding it. The hallowed home to Steelers and Pirates world championships was imploded in 2001 after construction of separate dedicated venues for football and baseball had been built in the same approximate area. Our present-day shot doesn’t have the detail to show you those sportatoriums–but trust me: they’re there–as are the casino complex, Stage AE, and various other new infill. 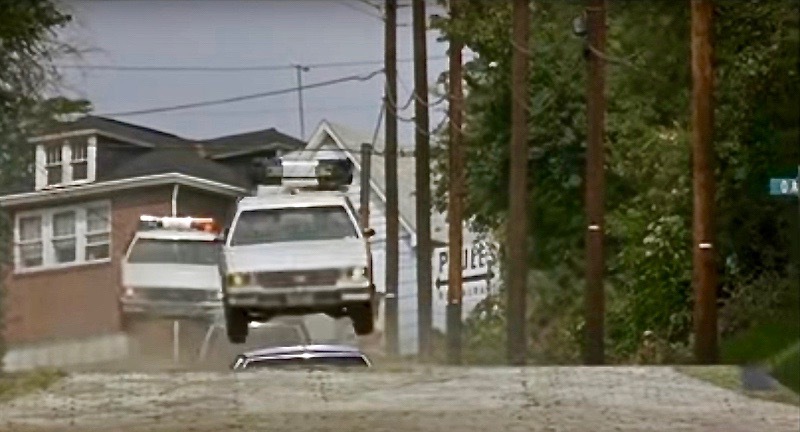 The holy grail of chase scene locations! Where is this camel back cobblestone road that launches all vehicles–from a toddler’s tricycle to a chain of police cruisers–off the street and into the air? This one really pushed The Orbit’s research team. 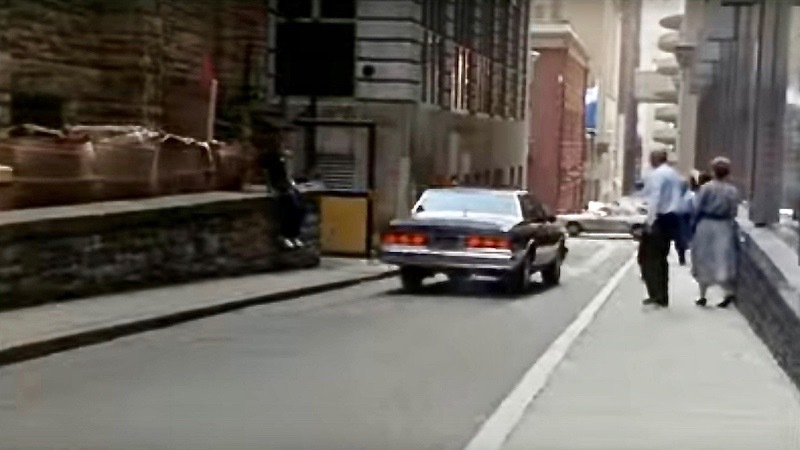 The only clue was the visible Oak St sign in the original clip, but it clearly wasn’t any of the Oak Streets Google Maps had to offer for Pittsburgh. 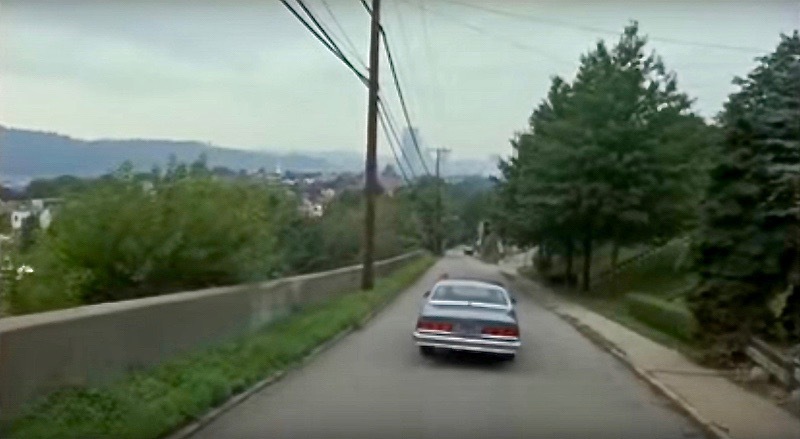 IMDB listed some additonal filming locations, including both Monessen and Monongahela, but it was obvious none of those was the right place, either. Never underestimate the combination of intuition, dumb luck, and Google Street View. We were finally able to ID the venue as Center Street in Duquesne. Center is still paved with the same hundred-year-old Belgian block, but it’s the terraced layout that really invites drama. 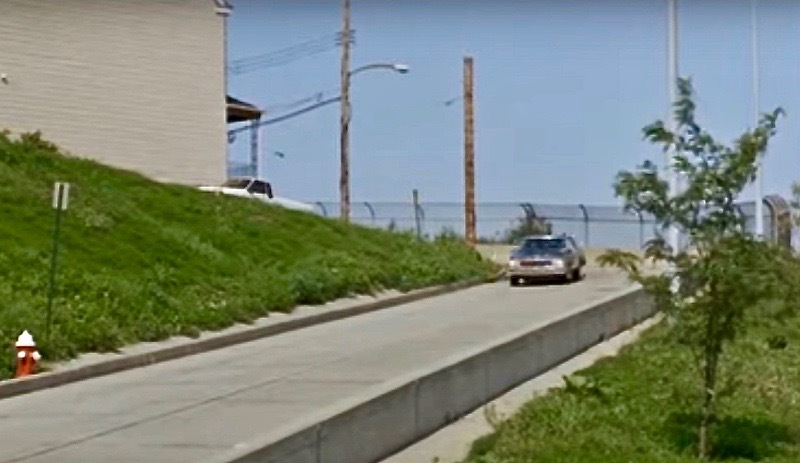 The road flattens at each point where there’s a cross street or alley, giving it the feeling of a ramp with landings. Now, I walked the four- or five-block length of Center Street, and while it is steep, no vehicles are leaping into the air all on their own–even going way over the speed limit. Herrington’s stunt coordinators must have installed extra jumps at each stage to launch the chase party so dramatically in the air, because that’s just not happening naturally. But then again, not happening naturally would describe how most screenings of Striking Distance take place. Ghost City. 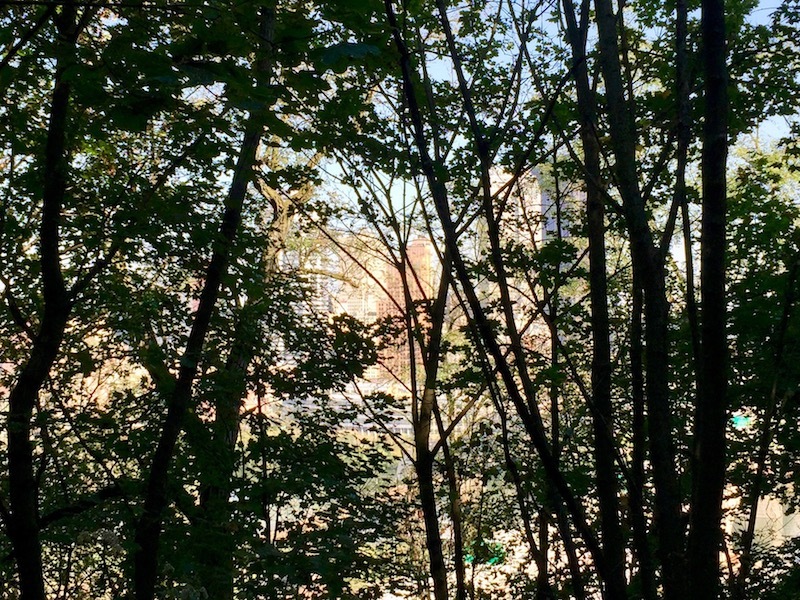 Downtown Pittsburgh as seen through trees on William Street, Mt. Washington. If Rod Stewart is to be believed, every picture tells a story. This one’s a doozy. In the photograph, the camera lens is roughly eye level with the tallest buildings in downtown Pittsburgh. They’re not “skyscraper” material, but we’ve got a collection of 40-, 50-, and 60-story towers that can legitimately feel “big city” if you pick just the right block to look up in. But here, it’s hard to actually see them–the distant office buildings of Grant and Smithfield Streets are heavily obscured by a foreground scrim of silhouetted trees clustered awkwardly, bent by nature, and leaning with no perceptible pattern. The city scene is so background, washed-out, and featureless behind the crisp black tree line that it’s nearly unrecognizable if you don’t know what to look for. 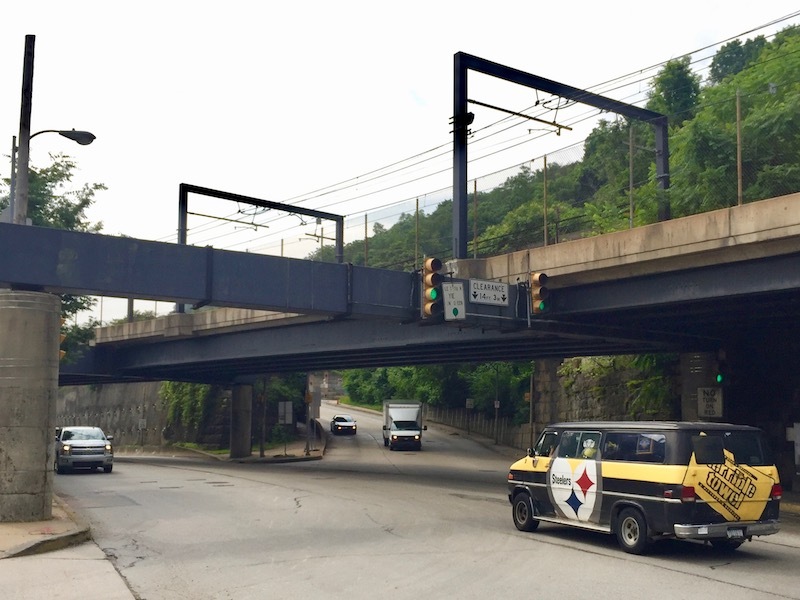 The storyline writes itself–Pittsburgh: the illusion of a big city within the reality of Appalachia. 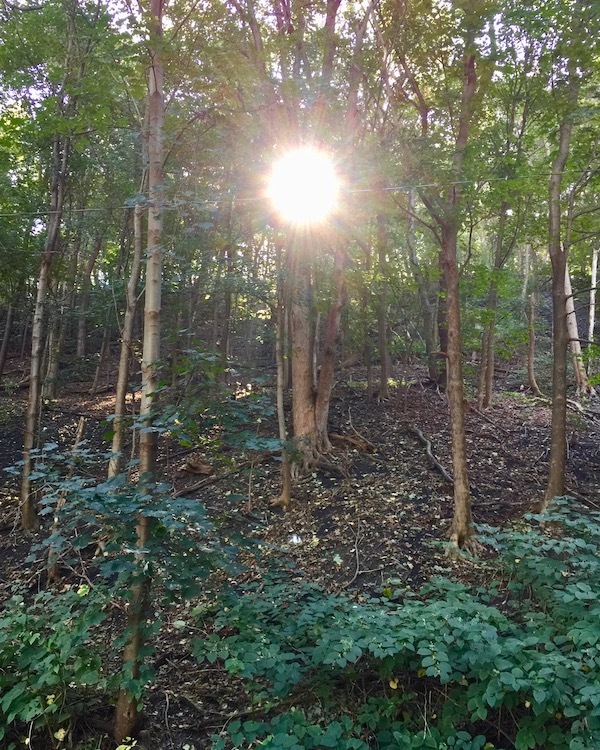 The bummer in taking a hike–if there is one–can be just getting there. As a person who’d rather not be in a car, the irony that one must drive to take a walk is befuddling and frustrating. It’s like purchasing new trash bags to just put them straight in the waste bin. Sure, you could live in a mountain cabin and hike right out the front door, but then you’d have to get in the car to buy your provisions–what a mess! Not so in Pittsburgh. 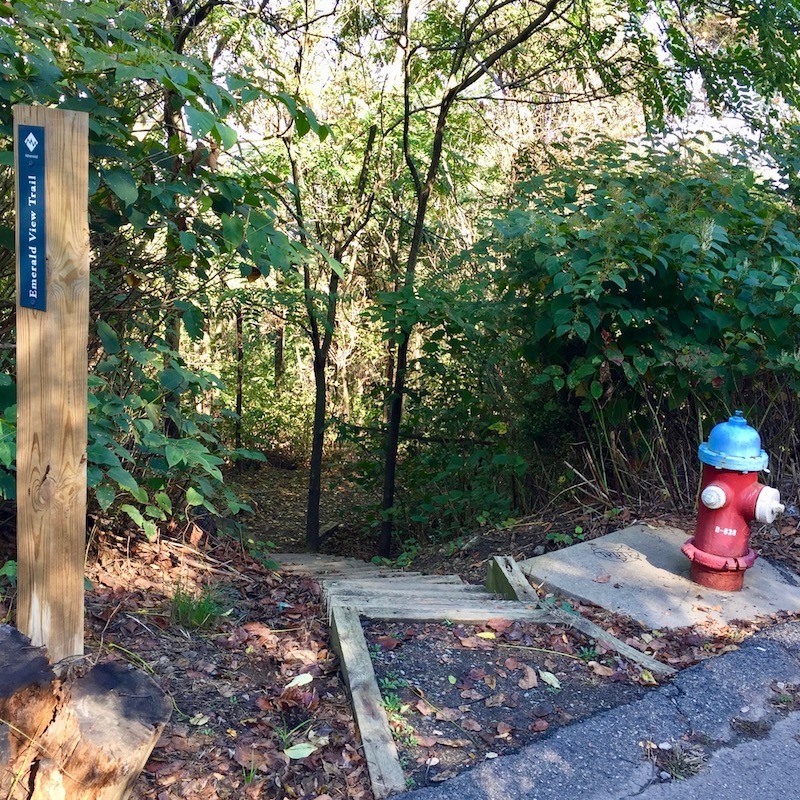 There are, of course, terrific woodsy trails in the city parks (especially Riverview and Frick), but one needn’t stop there. 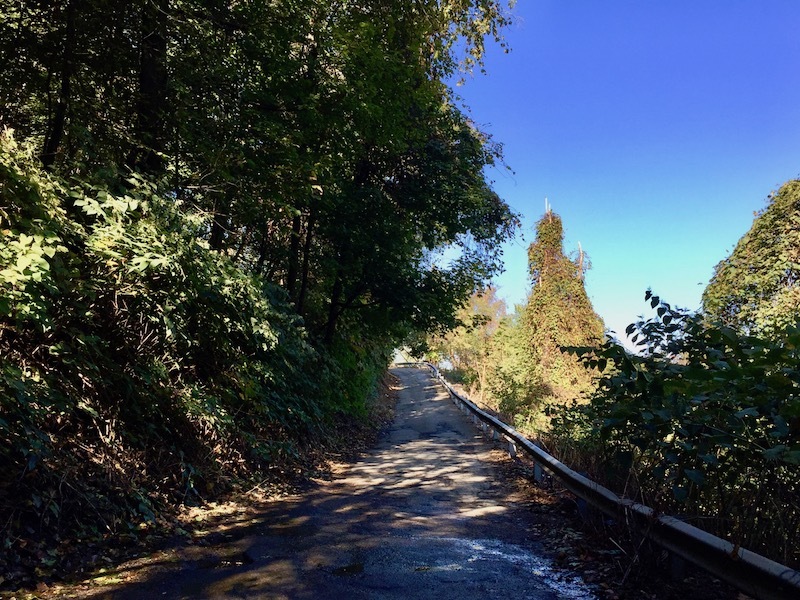 Between the up-and-down topography and relative sparseness of the hilltop communities, there are ample urban hikes just a bicycle ride or bus transfer away. Like the old joke, “I went a to a fight and a hockey game broke out,” we arrived at William Street last week on journalistic assignment and a hike happened. We were up on Mount Washington to track down and photograph the childhood home of [bygone football hero] Johnny Unitas. [For more on that, see last week’s story “A Football Team That Wanted Him: Johnny Unitas and the Bloomfield Rams” by David Craig.] Oh, we located the house–but we found so much more too. There would have been a lot more homes up here in young Johnny U’s day–frankly, it’s a bit of a surprise the Unitas house is still standing. William Street, which descends as a snake-slithering one-lane/one-way from Boggs Ave. down to Arlington Ave., has few remaining buildings today. 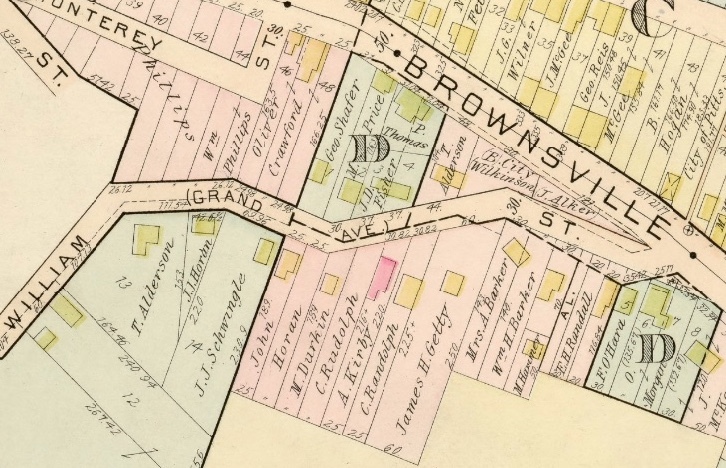 A 1901 map, however, shows us how many homes once stood along the road. 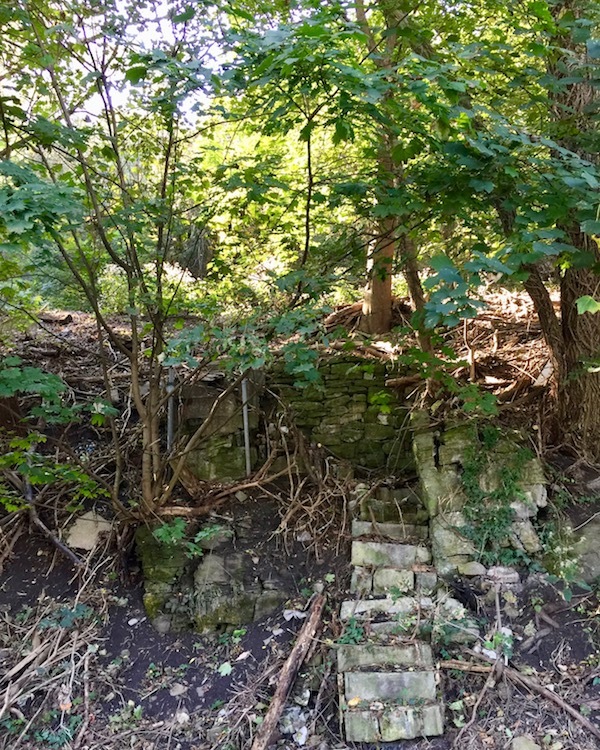 Whether that’s because the residential plots were requisitioned to create the surrounding park land or if it just got too difficult and expensive to maintain houses in a holler on the side of a mountain is unknown. Maybe one was a convenient excuse for the other. In any case, the signs of life are still here. Like any self-respecting city steps hike, the amateur archeologist is rewarded with nature-without-man trees growing through basements, layered stone foundations, felled chimneys, and still extant front steps edging right up to the roadside–all this as the sun’s halo casts a rich, dappled light through the lush greenery of Grandview Park. 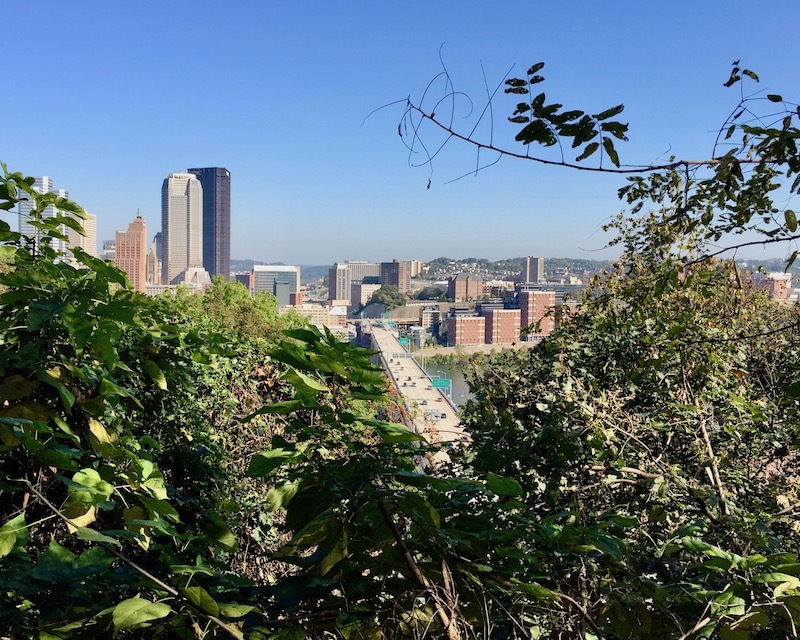 There’s a line that every Pittsburgher has a favorite view of the city–the West End Overlook, Grandview Avenue, or St. John’s Cemetery in Spring Hill, for example. The richness of options on this one little path make a fair case for William Street as two or three different best views. Near the top, there’s a unique look north-northwest to the side of Mount Washington proper–the big broadcast tower at the end of Grandview is an easy beacon. You also get the oddball collection of both traditional and uber-modern houses on little Cola Street in the foreground, plus a glancing shot at downtown and The Point. In the same general area, one can bag a nice sight line across the Smithfield Street bridge to the whole of downtown. Further down, as William bends to more of an east-west layout, there are vantage points looking directly down the Liberty Bridge and off-angles from either side. 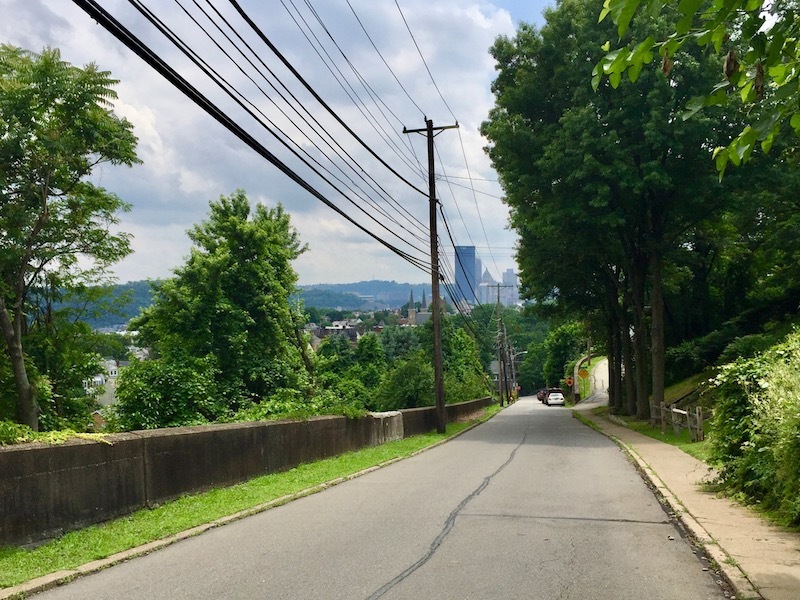 Here, you’ll get eyes on the jail, Uptown, Duquesne University, and all the way across two rivers to Troy Hill and Spring Hill on the north side of the Allegheny. William Street is not without its perils. One big section of the road has begun to crumble off the hillside. Other parts are so narrow there’s not a lot of margin for error. These are mainly concerns for the motorists rolling the dice as they travel downhill, but you’ll want to keep your wits about you. Citizen-hikers should take note: William is an active city street and cars will slowly edge by you while pumping their brakes. That said, it’s just not that busy–in the full climb up and back on a Saturday morning, we probably encountered less than ten vehicles. The street even provides for the folks who don’t consider a walk on pavement to be a “real” hike. 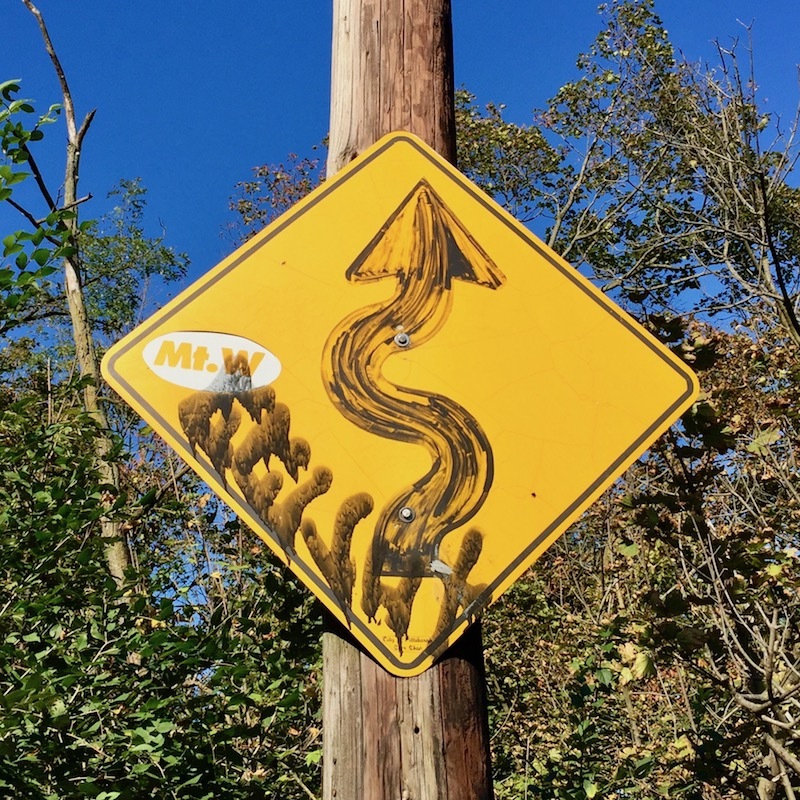 Climbers have the option to sneak off the asphalt and into the woods near the top of the hill. There, the terrific Emerald View Trail runs right across the street on its route from Bigbee Field/Grandview Park above to the woods around McArdle Roadway below. These are Pittsburgh’s salad days. Crisp, jacket-weather mornings followed by lush, unrelenting blue sky afternoons full of turning leaves, pumpkin-spiced and decorative gourd fall fantasias, plus a seeming mass conviviality we never quite achieve the rest of the year. Get out there and enjoy it.